I figured that since Weekend Homesteader is all grown up and ready to go into print, she deserved her own page. Those of you who want to hear the blow by blow, be sure to subscribe to the RSS feed. 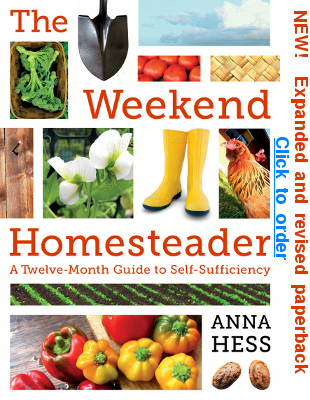 Meanwhile, I probably won't be blogging over here about Weekend Homesteader until I have books in my hand. But I couldn't help sharing the cover. What do you think? I'm conflicted, but I figure the publisher knows much more about covers than I do, so I agreed to let it go to press as is. What do I think about the cover? It looks like the cover of a book. I know that is stating the obvious to some degree. I think this is impressive though because it will increase the readership. I am proud of you especially because of how much work you put into writing, editing it, and pursuing this persistently over a long time period. Great work! That said I wonder if you took the pictures for the cover. Seems to me you are a better photographer than the one who did. I want to see Mark and you grueling away. Does this mean it is in print? I do really like the effect of the two pintos bellow your name. Not eggs, right? Maggie --- That's what I hope --- that the cover will do its job well, whether or not it's my photos. The only photos that are mine are the broccoli, the pea flowers, and the peppers. The book won't be in print until the fall. I like the beans too, even if they're not mine. I really like the cover. It definitely targets the weekend homesteader, the one who buys bright yellow muck boots and has a hobby farm. I think it will attract a lot of readers. Given all of your beautiful photography it stinks that you couldn't have more of it on the cover. BUT the cover is beautiful, eye-catching! As soon as I saw it (even before I noticed it was written by You!) my first thoughts were "Oooo I want to read that book!" Maggie --- P.S. --- Thanks for your kind words too. I really appreciate them. Emily --- Just what I wanted to hear about the cover catching your eye and making you want to read the book!! Lauren --- I love your alliteration! That's actually the theme of the whole book --- cheerful self-sufficiency --- so if the cover makes you feel that, it's spot on! The cover looks great. You should be proud! I am happy for you and couldn't think of anyone I know personally who deserves to see their work in print more than you. I love it. It has a modern feel to it, something I typically look for as a suburban homesteader with less than a quarter acre to work with! It may be a bit fluffier than what you had in mind, but it will definitely appeal to your target audience, which I'm guessing is a younger crowd that wants to get out and be independent and "stick it to the man". It's clean, crisp, and modern (although I think the art director should have found an image with muddy rain boots). I would buy this in a heartbeat if I saw it in the bookstore or on Amazon. I love it! it is bright and cheerful and inspiring. Only...you don't do row crops in a tilled field. That is seriously the only picture I have issues with, but if those are store bought tomatoes...then maybe with that one too. Sorry so critical, but you seem to value honesty. Everett --- Thank you so much for saying that! I'm looking forward to reading your book too! Fostermamas --- I'm glad to hear it appeals to you, since I think you're in our core target audience as well. Becca --- I know what you mean about the row crops. That was actually my first complaint when I showed the cover to Mark. But then I thought about it and realized that, occasionally, my garden might actually look like that --- if I raked back the mulch and was planting something like Swiss chard in rows in the bed, waiting to remulch until the seedlings were big enough. No worries about being critical --- I'm pretty critical too. It is really nicely done. Vivid colors, a nice composition. Compared to the other pictures of farm activity, and what I remember from my Grandpa's farm, everything does look a bit too squeaky clean. Especially the boots and the shovel. Roland --- So true. However, I'm not sure that anyone except me would buy a book that showed muddy boots and bug-bitten tomatoes on the cover. I'll just add my two cents and say "yep" looks awesome. It looks a little like those DK Illustrated Encyclopedias. Very nice. You're a pioneer in several ways. Cheers. Love the bright colors and your photos. I agree about the tomatoes! Looking forward to its release. J --- Glad you like it! I had a feeling you might be one of the ones who hated it, but glad to be wrong. Ben! So glad to hear from you! I know what you mean about "it is a book cover." That pretty much sums up why I'm willing to trust the publisher knows what they're doing. Chris --- I'm so glad you like it!